John Downey was born in Chicago. After having earned his Bachelor of Music degree from De Paul University and his Master of Music from the Chicago Musical College, he was awarded a Fulbright Grant to study in Paris. His stay in Europe was crowned with a Prix de Composition from the Paris Conservatoire National de Musique, and a Ph.D. (Docteur ès Lettres) from the Sorbonne (Univ. of Paris). Among the many composers with whom he has had the opportunity to work are: Honegger, Boulanger, Milhaud, and Rieti, as well as with Messiaen, Babbitt, Sessions, Krenek and Tcherepnin. He holds the title of Distinguished Professor of Music at the University of Wisconsin in Milwaukee where he maintains a vigorous schedule of teaching, composing, performing and conducting, and he is Director of Theory for the Milwaukee Youth Symphony Orchestra. He is also founder and director of the Wisconsin Contemporary Music Forum. 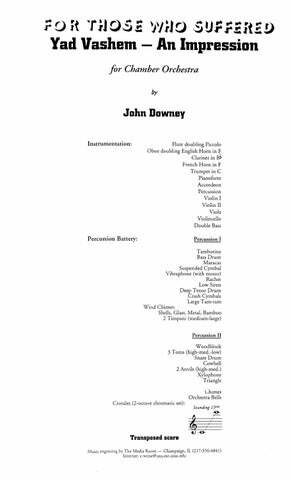 Downey’s music is characterized by concern for organic structure evolving in free-flowing sections (identified as “facets”), which are imbued with what he calls “undercurrent jazz”, and contain a rich harmonic palette and a strong feeling for instrumental color. 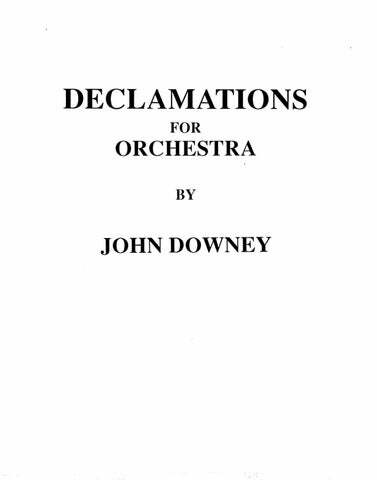 In quoting from the New Grove Dictionary of American Music, “Downey frequently uses modified serial procedures to achieve pitch coherence and large-scale harmonic relationships in his music; motivic development, sometimes polyphonically layered, in conjunction with timbral identities or tumbrel mixtures, further contribute to the overall structure. A number of compositions (for example, the Cello Sonata and the String Quartet No. 2) employ transformations of bell sonorities”. His output encompasses music for a variety of media, from chamber music and symphonic works, to electronic tape with light sculpturing and partially controlled improvisation as well as computer-generated sounds. 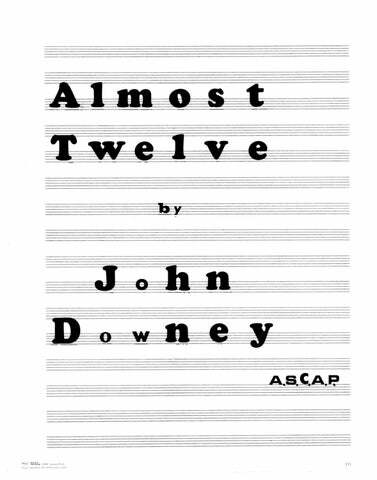 John Downey has written over seventy compositions to date. John Downey is the recipient of a number of important awards, commissions, and honors, some of which are from the National Endowment for the Arts, the Ford Foundation, the Copley Foundation, ASCAP, the University of Wisconsin, the Wisconsin Arts Board, the Moebius Foundation, the MacDowell Colony, the Milwaukee Symphony, the Fine Arts Quartet, the Woodwind Arts Quintet, Gary Karr, George Sopkin, Stephen Bassoon, Robert Thompson, the Milwaukee Youth Symphony Orchestra, and others. He was the recipient of the Walter Heinrichsen Award bestowed upon him by the American Academy and Institute of Arts and Letters in New York City. In 1980, he was knighted by the French government and named “Chevalier de l’Ordre des Arts et des Lettres.” He is a member of the American Music Center, the Society for Composers, Inc., the American Federation of Musicians, Mu Phi Epsilon, Phi Kappa Phi, Delta Omicron, among others. He is listed in Who’s Who in America, Who’s Who in the Midwest, Who’s Who in the World, International Who’s Who in Music, Baker’s Biographical Dictionary of Musicians, and The New Grove Dictionary of American Music. Downey is the author of a 600 page book entitled, La Musique populaire dans l’Oeuvre de Béla Bartók, and has contributed articles to several professional publications. 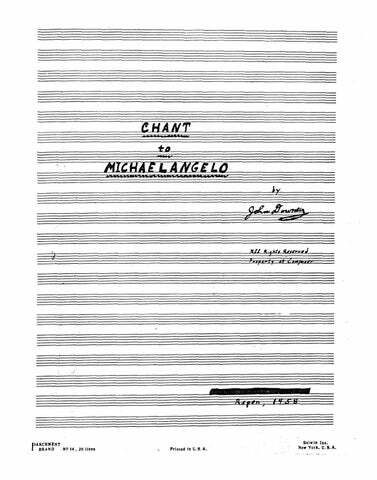 His compositions have been recorded on Orion Records, Composers’ Recordings, Inc., Cala Records of London and New York, the Gasparo label, Chandos Records of England and Heritage Records. His music is published primarily by Theodore Presser Company and C.F. Peters in the US, and Gérard Billaudot in Paris, France. John Downey enjoys an international reputation and his works have been performed nationally as well as in Canada, Mexico, South America, Western and Eastern Europe, Africa, the Middle East, Israel and Australia. He is often invited to attend performances of his works both here and abroad, where he performs, conducts and lectures both about his own music and contemporary American music in general. Thus, in the late eighties, he was a featured composer at three music festivals held in Rio de Janeiro, Santos, and São Paulo, Brazil. During the 1990 season, he lectured at the Royal Academy of Music in London where his Discourse, one of the compositions recorded on the Cala release, has been performed in the Festival of American Music. In the summer of that year, he was invited by the Board of Directors of the Lvov Philharmonic Orchestra in Ukraine to conduct a program of his works (which included Discourse and Declamations, another composition on the Cala CD,) with their orchestra in Lvov’s historic Philharmonia Hall. He was perhaps the first US composer to have been presented in a concert devoted entirely to the music of a contemporary American living composer in the former Soviet Union since the advent of glasnost. The event has been telecast and radio-broadcast all over Ukraine. Subsequently, one of the orchestral compositions played at the concert was chosen for performance at the First International Festival of Contemporary Music in Kiev, Ukraine. Another one of the four symphonic works on the Cala release, the Concerto for Double Bass and Orchestra, had its world premiere performance in September 1987, at the prestigious Opera House in Sydney, Australia. Gary Karr, the renowned double bass virtuoso, commissioned the work and premiered it with the Sydney Symphony Orchestra under the baton of Geoffrey Simon. 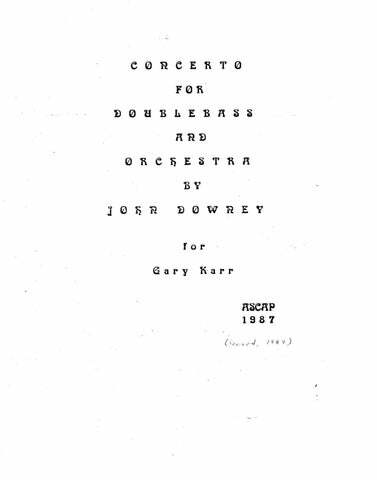 Karr and Simon gave its American premiere with the Albany Symphony at the Troy Music Hall in 1989. The work has received further performance by Gary Karr at Hartt College in Connecticut, by the Milwaukee Symphony Orchestra and the Milwaukee Youth Symphony Orchestra with Roger Ruggeri as bass soloist. Jingalodeon, another work on the same CD, has been performed a great number of times. It was commissioned and performed by the Milwaukee Symphony with Kenneth Schermerhorn conducting. James Paul and Paul Polivnik conducted it several times with the Milwaukee Symphony. Gilbert Amy taped it for Radio France with le Nouvel Orchestra Philharmonique de Paris. It has been rebroadcast a number of times throughout France. Mark Starr, Geoffrey Simon and Paul Suskind also conducted this work with various orchestras. Declamations, the fourth composition on the Cala CD, also received a number of performances. It was premiered by Geoffrey Simon with the Albany Symphony in December 1985. Later, it was conducted by Manuel Prestamo in the United States and South America, and by Roger Boutry in Paris with l’Orchestre de la Garde Républicaine. 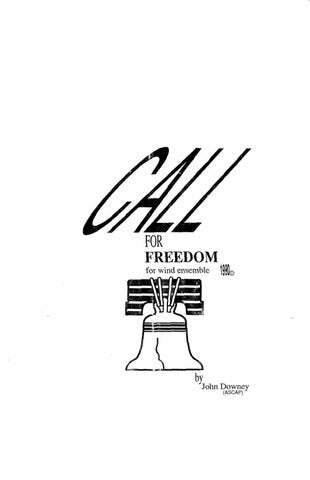 John Downey conducted it during a tour of Austria, Switzerland and France with the Milwaukee Youth Symphony Orchestra during the summer of 1987. 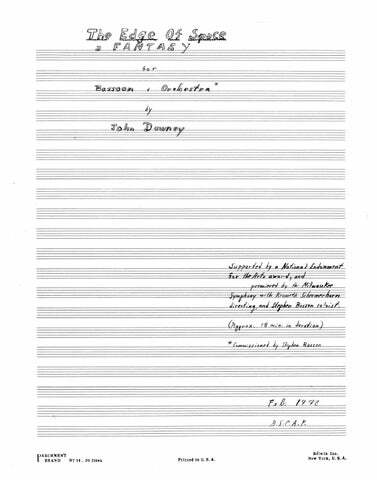 Other conductors who have performed John Downey’s music, include Izler Solomon, Sergiu Comissiona, Eugene Bigot, Alain Louvier, Pierre-Michel LeConte, Lukas Foss, Margaret Hawkins, Milton Weber, Stanley DeRusha, Margery Deutsch and Zdenek Macal, among others. John Downey resides with his wife, Irusha, linguist, translator and poet, in Milwaukee, Wisconsin. He has collaborated with his wife on several occasions, setting to music her original works as well as her translations. His setting of her poem, Un Dauphin, and its English version, A Dolphin, is proving to be one of his most frequently performed chamber compositions. for Chamber Orchestra 18:30 1 1 1 1 – 1 0 0 0; Perc. Str. 14:00 3(Picc.) 2 3(B.Cl.) 2 – 4 4 3 1; Timp. Perc. Str. 16:00 3(Picc.) 3(E.H.) 3(Bb, A, B.Cl.) 3(Cbsn.) – 4 3 3(Bass) 1; 3Perc. Str. (Yad Vashem – An Impression) 26:00 1(Picc.) 1(E.H.) 1 0 – 1 1 0 0; 2Perc. Pno. Accord. Str. for 24 Flutes 17:00 4Picc. 7Fl. (divisi) 4AltoFl. 2B.Fl. 6’30’ 2 2 2 2 – 4 2 3 1; Timp. Perc. Str. for Orchestra 8:15 3(Picc.) 3(E.H.) 3(B.Cl.) 3(Cbsn.) – 4 3 3 1; Timp. Perc. Str. for Orchestra 43:00 5 3 4 3 – 6 4 4 1; Timp. 5Perc. Pno. Cel. Hp. Str. 28:00 Solo Cb. ; 3 3 3 3 – 4 2 3 1; Timp. Perc. Cel. Hp. Str. for Bassoon and Orchestra 20:00 Solo Bsn. ; 2 3 3 2 – 2 2 3 1; Perc. Cel. Hp. El.Gtr. Str. for Wind Ensemble 7:00 3 3 3 3 – 4 4 3 1; Timp. 5Perc. 2Hp. 2Cb.